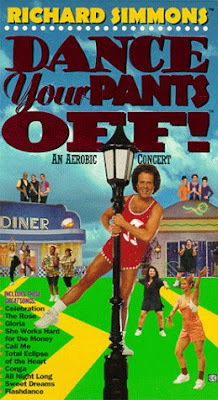 Richard Simmons: Dance Your Pants Off. I'm sorry, but under no circumstances do I want Richard Simmons mentioning my pants. Ever. "Total Eclipse Of The Heart". "Total Eclipse Of The Heart"! You're meant to work out to Bonnie Tyler's overraught, Wagnerian magnum opus? Is it the 47 minute version or only the 17 minute radio edit? And "The Rose"? Double that with "Eclipse" and you've got the most depressing work-out ever! "Come on, work it, people! ... Why are you all curled up into the fetal position and sobbing?" Posted by Doug A Scott at 8:11 p.m. Remember what I said about tossing in a few cartoons when you run out out of stuff to say? March 30, 2007 at 6:49 a.m.